We have gotten to know the Region of Araucania. In order to see what and how much you have learned, we recommend you go over the tips, summaries and answer a few check up questions. In chapter thirty three of our collection, we have gotten to know the Region of Araucania. In order to see what and how much you have learned, we recommend you go over the tips, summaries and answer a few check up questions. The northern border of the region of Araucania is the region of Biobio; the southern border is the region of los Rios; the eastern limit is Argentina and the western one is the Pacific ocean. Its total population is 869,535 inhabitants (2002 Census), which equals 5.8 % of the national total. 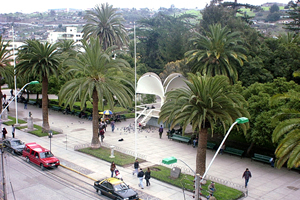 The regional capital is Temuco and administratively it is split into two provinces: Malleco and Cautin. The intermediate depression grows more undulated in this area. There are three great hydrographic basins: the Imperial and Tolten rivers and great part of the great basin of the Biobio river. There are four distinguishable types of climate in this region: warm temperate with a short four month dry season; rainy temperate with a Mediterranean influence; cold, rainy temperate and icy caused by altitude. The main economic activities of the region are agriculture, livestock and the forest sector. There is a laurel forest in the coastal area that has an understory with plenty of ferns and epiphytes. A few of the main tourist attractions of the Malleco province are Angol, the Malleco viaduct, Capitan Patene and the Tolhuaca hot springs. “Authorized for circulation by Resolution Nº190 from June 12th, 2008, from the National Direction of Borders and State Limits. The publishing and circulation of the maps that refer to or are related to the limits and borders of Chile do not in any way compromise the State of Chile, in accordance to Art 2º, letter g) of DFL Nº83 from 1979 from the Ministry of Foreign Relations”.